Pick any rose you fancy, take off all of the leaves and diagonally cut off the head of the rose (cut in the stalk, about 3 centimetres from the flower). If the flower still looks nice, you can put it in a cute little vase; it will look really nice! Next, take the potato and drill a hole in it that’s just as wide as the stalk of the rose; make sure the stalk sits tight within the hole and can’t wobble. Cover the bottom of the pot with 5 centimetres of potting soil, and place the potato on top. Fill the rest of the pot with potting soil. Cut off the bottom of the plastic bottle and cautiously place it over the stalk that’s sticking out of the soil. 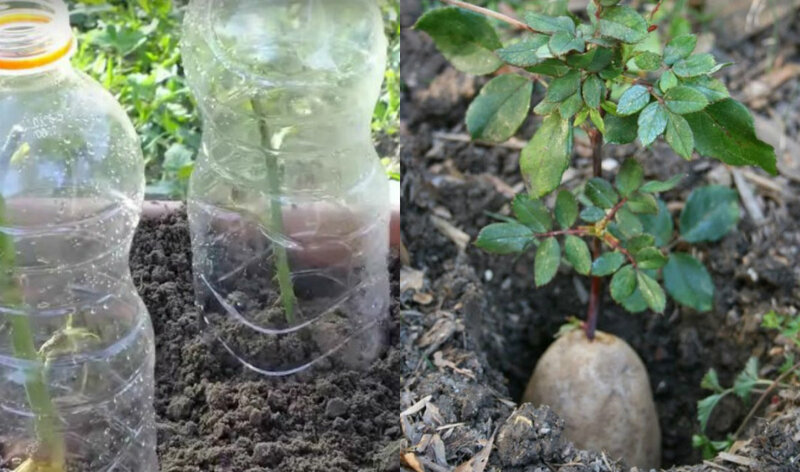 Water the rose from time to time (around the bottle) and see how your roses grow like they’ve never done before! Written instructions are all fine and dandy, but it can be really useful to actually see what you have to do. Luckily, there’s a very handy video that shows you exactly how this trick works. Take a look below!